In large bowl, gently toss apples, pears, granulated sugar, 1/4 cup flour, the cinnamon and salt. Let stand 15 minutes. Place 1 pie crust in ungreased 9-inch deep-dish glass pie plate; sprinkle lightly with 1 tablespoon flour. Spoon apple mixture into pastry-lined pie plate; dot with 2 tablespoons butter. Sprinkle with 1/2 cup of the toffee bits. Top with second pie crust. Flute edges as desired. Cut slits in several places in top crust to allow steam to escape. Bake 50 to 55 minutes or until golden brown; remove pie from oven. Meanwhile, in 1-quart saucepan, melt 1/2 cup butter over low heat. Stir in brown sugar and half-and-half. Heat to boiling, stirring constantly. Remove from heat; stir in pecans. Spread sauce over top of hot pie; sprinkle with remaining toffee bits. Cool 2 hours before serving. 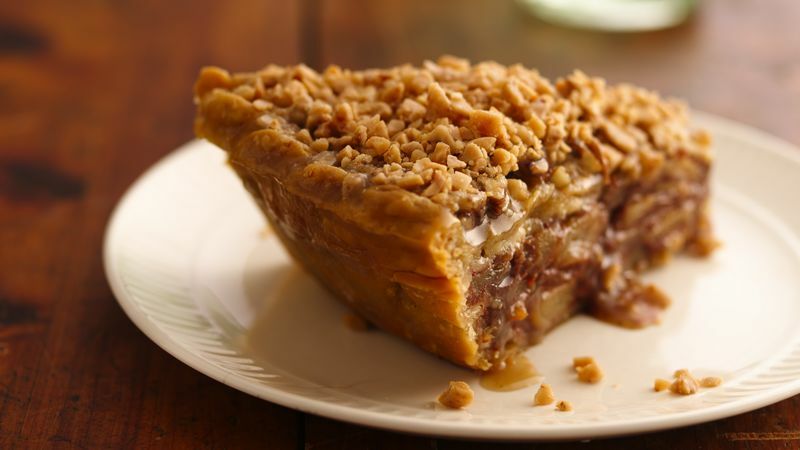 For a special presentation, top each slice with a dollop of whipped cream sprinkled lightly with toffee bits.